We all want to grow healthy cannabis plants. Ask any green thumb, and they’ll tell you that using Epsom Salts is one of the gardener’s most trusted hacks for growing strong, nutrient-rich plants. 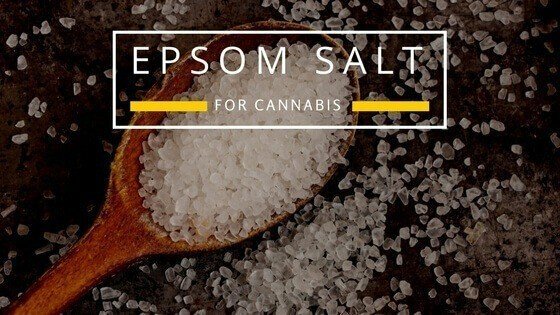 Today, I'll show you why you should use Epsom Salt for cannabis. 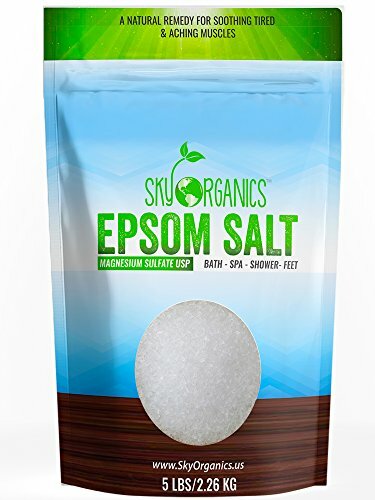 Epsom Salts are a naturally occurring mineral known for its nutrient-rich properties, specifically in magnesium and sulfur (magnesium sulfate). As a result, Epsom Salts have made their way into the marijuana grower’s toolkit as a crucial provider of magnesium and sulfur that cannabis needs. They’ve been used for both horticulture as well in natural health care treatments for hundreds of years. 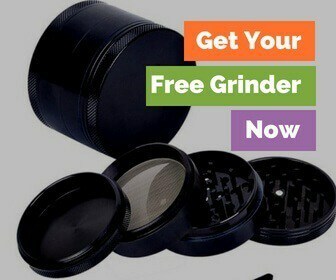 They're usually available at any gardening store, pharmacy or health food store due to their wide array of uses. Magnesium sulfate is important for soil and plants to keep a healthy pH balance that promotes healthy growth. This advice pertains as much to the marijuana plant as it would any other plant. Epsom salts provide about 10% magnesium and 13% sulfur which has proven to be an effective balance for plant nutrition. All this despite there being no exact calculation for magnesium sulfate levels for marijuana plants. Magnesium is particularly important because it helps to strengthen the cell walls in the seed. And it helps to carefully guide the roots through the seed wall during sprouting. It's a crucial mineral required for photosynthesis in plants where the chlorophyll allows the plant to absorb energy it needs. Sulfur helps your plant develop vitamins, amino acids and enzymes that help it stay nutrient-rich and healthy. Like magnesium, sulfur is important for the production of chlorophyll. It’s also important for the prevention of plant diseases. It's a super important part of the grow process. Soils tailored to cannabis growing already contain the right amount of magnesium and sulfur as well as the other nutrients required by cannabis. As such, Epsom Salts aren’t always necessarily needed when the soil is already balanced. However, when a plant lacks magnesium sulfate, Epsom Salts provide a natural, low-cost way to ensure your plants are getting its share. Keeping a close eye on your plant and the color of the leaves will help you recognize whether your plant is starving for magnesium. A magnesium deficiency will show up on the bottom leaves on your plant—they start to turn yellow between the veins. You’ll also notice growing has slowed and the plant looks “droopy” and unhealthy. 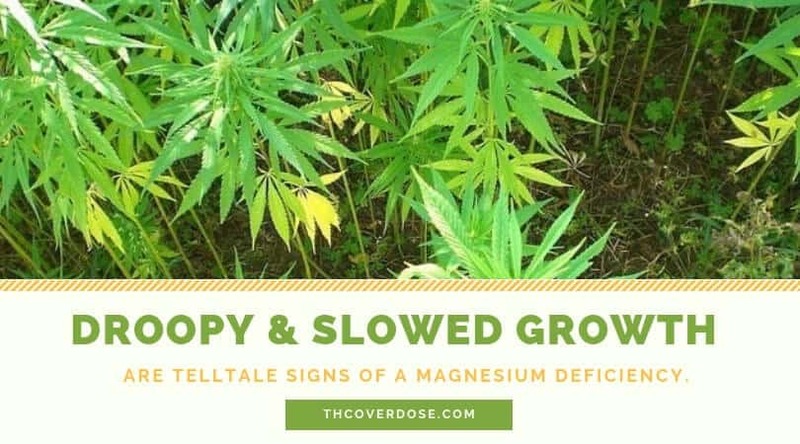 If you do not catch a magnesium deficiency, the yellowing will start creeping up your plant to the top leaves and yellowing will get worse on the outsides of the plant. A sulfur deficiency will present itself very similarly as a magnesium deficiency in the yellowing of the leaves. In a sulfur deficiency, your bud may also start to fall off, which tells you that you have a problem. In these cases, Epsom Salts can prove to be the significant boost that your plant needs to get back on track. As touched on above, it’s important to note that Epsom Salts may not be the cure-all for your plants, though. Growers using soil often use Epsom Salts to make a solution that they can use as a spray or place right into the soil before planting. This ensures their plants are receiving magnesium sulfate from the get go. 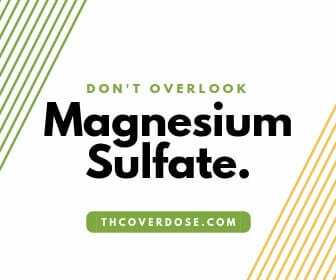 As mentioned before, many cannabis-specific soils already contain magnesium sulfate, so adding more could overfeed your plants, causing adverse effects. When looking to give your plants a magnesium sulfate bump, a recommended solution is 1 teaspoon to 4 liters of water (approx. 1 gallon or a little less). If not added to the soil upon planting, this Epsom Salt solution can be sprayed on your plant directly. It can even be placed into your plant’s water reservoir during watering. Growers recommend spraying leaves with the Epsom Salt solution every three to four days. But, to clean leaves of residue, replacing the Epsom Salt solution with clean water every so often. 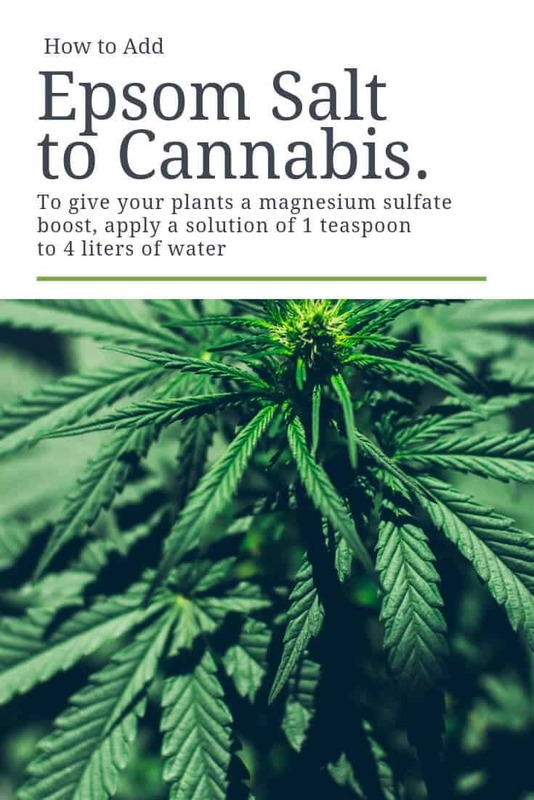 Growers usually observe that once you introduce the highly-soluble Epsom Salt to the plant, the plant absorbs the magnesium sulfate relatively quickly, restoring plant health. Small growers, who are cultivating cannabis at home, usually get more benefit from dissolving the salt into the warm water, instead of using directly in the soil. One of the methods suggested by leading cannabis cultivators is to use an Epsom salt foliar spray. A foliar spray is a way to introduce microbes, nutrients, and pesticides through the foliage instead of the roots. This usually means a schedule of hand-spraying various solutions over the leaves, at specific times of the growth cycle. Dissolve one tablespoon per gallon of warm water. Allow the solution to cool. Spray foliage of cannabis plants, targeting the underside the leaf. You should spray every few weeks during each cycle, and wean the plants off during the final stages of flower. You’ll also only want to spray in the dark, avoid spraying in the light period of the day. Its healthier for the plants to be cooler, rather than hotter, as they absorb the nutrients. Just because you grow hydroponically doesn’t mean you miss out on the boosting ability of Epsom salt. Hydroponic systems require a little more finesse when it comes to Epsom salt, but with a good understanding of how your specific system works, they are straightforward to add. Most growers use a sump or mixing tank to mix the nutrients into the solution thoroughly and to keep the mixture moving on a constant basis. Epsom salt is only one of many components to consider incorporating into the nutrient solution, including a standard N-P-K mi and calcium nitrate. On the back of your fertilizer, you should find it easy to follow instructions on quantity to add, as well as guidelines for the Epsom salt. It’s hard to make suggestions, without knowing the size of the system and the number of plants involved. That is why it’s always best to follow the instructions on the nutrient mix. Hydroponic growing requires constant monitoring of nutrient levels, which means you’ll also be looking at the magnesium levels. Adjust as needed throughout the growing process. While many marijuana growers boast the effectiveness of Epsom Salts, for magnesium and sulfur, it can’t be wholly relied upon. And it can't act as a stand-alone nutrient delivery system. Your plant and your soil will also rely on other nutrients such as calcium as well as the vital mix of “NPK” which is the Nitrogen (N), Phosphorus (P) and Potassium (K) to grow to be a strong and fruitful plant. For the grower about to reach for the Epsom Salts, you’ll want to take into consideration the nutrient level the soil you're using already has. And any other added nutrient solutions. Not to mention how your plant is growing and looks to determine its health. Don’t overuse Epsom Salts in your growing process thinking you’re doing your plant good with heavy doses of other nutrients. This is known as plant toxicity. Overfeeding your plant with certain nutrients can cut out the effectiveness of other nutrients. For instance, too much magnesium can lock-out, or block, a plant’s required calcium. Did you add too much Epsom salt to your garden? You’ll see some issues early on, which means you've been doing a great job as a cultivator! Check your crop daily for issues, including unhealthy indications on the plant itself. New leaves are slowly losing color from the middle outwards. You’ll see yellowing in the center, and as the issue progresses, you’ll notice it spreads to the tips. Sometimes, the visible signs start near the bottom with the older fan leaves. In this case, you may notice a more widespread and even yellowing with a few spots. In any case, with daily monitoring, you’ll quickly catch the issue and can counter it. Epsom Salts, while not a stand-alone nutrient delivery system, are good for any grower to have on hand at all times. They help set the foundation for healthy soil. Also, they ensure that your plant remains stable and healthy as the grower provides their plant all it requires for a successful harvest.